The wonderful group called Musk roses were developed in Essex in the UK by a local clergyman, Mr Joseph Pemberton, they are a hybrid between the species Rosa moschata and Rosa multiflora hybrids. 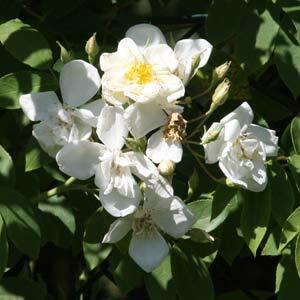 The plant we know as the ‘Persian Musk Rose’ is Rosa moschata var. nastarana a hybrid. These fragrant roses are wonderful in the garden for a good display of perfumed flowers over a long period. Over time they will form a good sized bush to around 1.5m, some have a little more vigor and could be used as a ‘low growing climbing rose’. These are a clustering type of rose, large groups of flowers in doubles, singles and a few interesting simple petaled types as well. Two well know Musk roses are the white flowering ‘Pax’ named at the end of WW1, and the fragrant ‘Felicia’ with its large pink flowers. Why are Musk Roses so good? They are fragrant, repeat flowering, and quick to re flower, they are bushy and easy to prune and are also regarded as disease resistant, or should we say very quick to recover from blackspot and powdery mildew. They are on of the few roses that grows well in part shade. These are a rose that will produce masses of rose hips, some gardeners choose to leave them for added interest in the winter, other choose to deadhead them to promote more flowers.